"Lets make paint that even a contractor like me would use, that truly does not poison the earth or anyone on it." 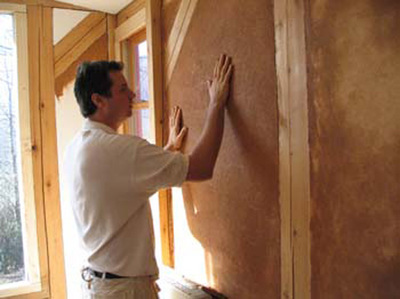 Earthpaint produces only Healthy Sustainable Finish! But the founder of Earthpaint was once a die hard contractor who did not believe that a healthy sustainable paint was worth using. In fact, like other contractors, he was absolutely convinced that the more toxic something was, the better it performed. Earthpaint was founded by Tom Rioux, a professional painter, starting as an apprentice at 14 years old. Tom built a profitable career as a professional painter but by 31 he was poisoned by the paints and wood finish he was told were safe. His industry was ignorant, good people but unaware of the dangers lurking from chemical overexposure. After overexposure, Tom spent many years working sick, often crippled and fighting for life. Tom narrowly survived. Even after intense medical intervention there has been permanent damage including severe chemical sensitivity and an auto immune disorder that persist. This in all probability was caused by chemicals of his trade. Toxicity of chemicals in paints and wood finishes were previously unknown to Tom. It took a long time to become clear. Going from one toxic building to the next there seemed to be no reason for a sudden flare and illness. Eventually, after many years determined to work while sick and on chemotherapy, Tom was forced to stop working and focus on healing. The disease threatened his life and was not improving. 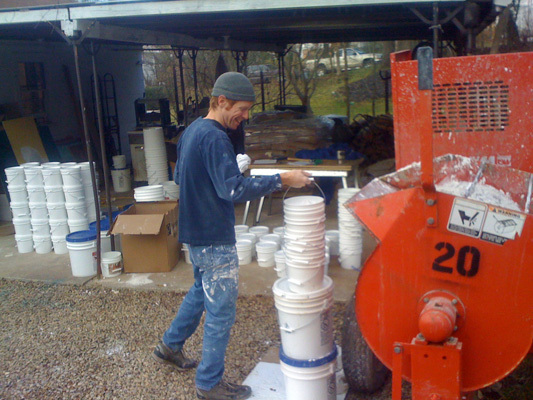 It was only after moving to a Zen Center in Asheville, NC that the toxicity of paint started to become more clear. Asked to test some "non toxic paint" that someone at the Zen Center had bought; Tom did what he always did to initially test a paint. He smelled it, brushed it on, rolled it, rubbed it and dipped his fingers in it to feel the smoothness and viscosity. It was clear this was a cheap vinyl acetate based paint. So Tom said, "This is just a cheap vinyl paint. Something we might use for primer at best." Within hours of testing that paint, the auto-immune disorder attacked his hand making it hard to hold even a pencil or fork. Tom was left wondering, why? Why? Why? The picture got clearer as he noticed that there was still paint on his hand from the cheap vinyl "non toxic paint" that he was asked to test. Then it occurred to him. Tom describes his thinking process, "Oh my gosh! I've been spreading poison around the earth! It was the paint that poisoned me! I can't believe this garbage paint is sold as non toxic! No contractor would bet his reputation on this lousy paint! And it's just vinyl acetate. The lowest of the low. Somebody has to create a paint that doesn't have poison in it! I can't believe I trusted these paint companies. They said the "water based paint" was supposed to be safer! Yet, it turns out I didn't even know the truck was about to hit me. The water based paint had no toxic smell to run from. At least with oils I could smell the toxicity and get out of the room. This is a big problem! How many painters, families, workers are sick at this very moment and have no idea it's because of the toxic building they sit in?!" This thought process unraveled like a spring unwinding and the reality dawned, only a painter is going to be able to help others avoid the kind of toxic overexposure he endured. Blessed with life and gratitude his focus became this vow, "Lets make paint that even a contractor like me would use, that truly does not poison the earth or anyone on it." 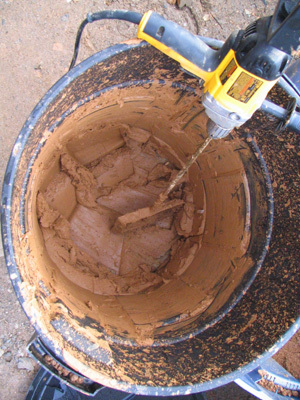 The first attempt was the beautiful, red clay rich soil from the Zen Center mountainside. Soil was dug, cleaned, and mixed carefully to create a thick textured paint rolled on the instrument room walls. That was in 2004. To this day it remains intact. Hundreds of people have walked past it on the way into the zendo (meditation hall). Yet, it still holds a vibrant atmosphere. While mixing this paint and working on this instrument room the project was discussed as "the earthpaint room" and this is where the name Earthpaint came from. The logo for Earthpaint also came from Tom's Zen training. 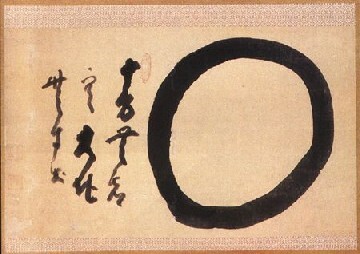 The painted circle logo is called an Enso. It is a circle, painted with one fully engaged stroke, flying white spaces are seen where the brush naturally skipped some spaces, yet the circle is whole and complete. This inherent wholeness of the circle signifies action forth from the non dual nature of things: freed of the false belief in a fixed, permanent self. It is a reminder that Earthpaint stands for unselfish work for others. Specifically, to make paint that truly holds to the vow of making healthy sustainable finishes. The Enso reminds us that seeking profit for self gratification only leads to people getting poisoned by paint. Somehow life has come forward to sustain this belief. In good times and hard, we've come to rely on this faith to sustain and direct us. 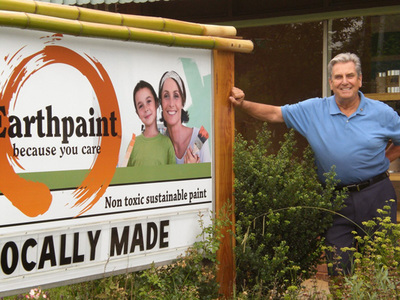 Since 2005, Earthpaint has managed to be sustainable yet not profit driven. Perhaps, there is some alignment to faith, work and service for others. This is the basis for Earthpaint’s deep, life affirming commitment to make strong, safe paint and wood finish. Tom's vow became a family and community vow, locally in Asheville at first and then spreading nationally and internationally. Many of the brightest minds in chemistry and coatings have come together as a team to support this deep affirming commitment. This is why Earthpaint has so many technologically advanced coatings. Earthpaint offers beautiful floor finish, deck stain, wood finish and non-toxic paint products that are as good or better than conventional paint and wood finish. It is a team of industry veterans working together in the belief that there needs to be a place where safe coatings can also be bombproof. The eco industrial aspect of Earthpaint has been a sustaining aspect. Those products are mostly sold direct to business but some of them are available to public on this website. Before green was an eco-building term, Earthpaint was the first, and may still be the only, USA based Healthy Sustainable Finish manufacturer. Earthpaint is proving that there are better, kinder alternatives. Since our launch some of the biggest names in coatings have followed designs we pioneered. Unfortunately, when profit and self gratification become the basis for a company, that company ultimately must sacrifice integrity. This does more harm than good and is not sustainable. 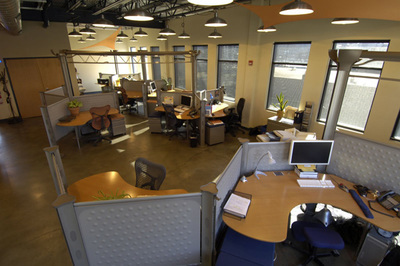 This is the principle behind our factory direct, online sales. It is sustainable. We can maintain product integrity. The internet is one of the only places left that the old fashioned "MOM and POP STORE" can still survive in a world whose laws and economies are often controlled by selfish interests. We do not use toxic petrochemical solvents or benzene in deck stain. We do not use cheap mineral spirits fillers or any of it's misleading code names in our natural oil wood finishes. No naphtha, toluene, xylene, MEK or benzene in our wood finish. The old trick of adding cheap Vinyl Acetate to paint and calling it Zero Voc is not something you will find here. It must be quality and safe. No Poison! Polyurethane is almost always made with isocyanates but most people only hear about "VOC", meanwhile other true concerns are missed. ​We believe it's impossible to make oceans of isocyanates year after year and not expect severe health consequences, so we have gone through intense pains to make isocyanate free floor finishes. This isn't something a profit driven corporation does. There is a place for isocyanate use but it must be limited, expertly crafted and clearly labeled. Chemical Biocides and Fungicides are extremely toxic. Again, we don't believe this poison is sustainable so we have developed Lime Prime which actually works better using the basic minerals of nature. It is only because of our vow that we take on these strains. Paint formulas are confusing to consumers. We are confident that Earthpaint is living up to it's vow and providing the safest alternative on the planet! Our biodegradable paint and wood finish contain non-toxic and natural ingredients derived from plants, vegetables, trees, minerals and elements. Nearly all of these finishing components are gathered locally (within a day’s drive of Asheville, NC) and are domestically produced and harvested. 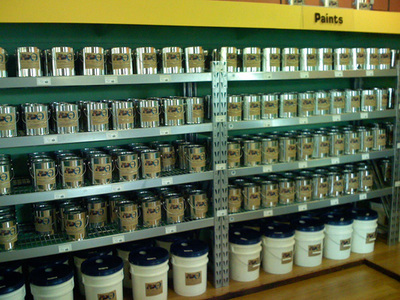 We avoid using anything in our paint and wood finish that gets shipped in from overseas. Yet, our cashew resin is made from food waste from Brazil. Since this is the best renewable, sustainable and natural urethane we feel shipping some food waste from Brazil is worth it. So, flexibility is called for. Embodied energy and the entire ecological footprint is examined throughout the paint and wood finish formulation process. It is then reexamined on a yearly basis because things change and we must be responsive to that. One of the very first "Earthpaint" walls. 1st Company owned store, West Asheville, NC. GARAGE ROOTS: Lime being mixed.